Scott has a nice piece on Google Gears - Google's recent move to bring local-storage and offline capabilities to web applications. This is a huge move and is quite brilliant. In one seemingly innocuous move (and one tiny 700k (yes, 700K) download) Google is well positioned to get Google Docs, including Writely, Spreadsheet and Presentation, along with who knows what else, enabled for offline use. And the whole thing is Open Sourced via the New BSD License." I could probably come up with some flimsy rationalization about how this post is dripping with insight into software architecture and how if you study it carefully and pay close attention, the secrets to unencumbered enterprise delivery will be unlocked. I'm just having fun with a recent addition to Google Maps that I stumbled into tonight. Turns out Maps has added "Street Views", a feature that allows you to view photographic representations of locations visited on the map. As of tonight, views are available for Denver, Las Vegas, Miami, New York, and San Francisco. Click on the "Street View" button next to "Traffic", "Map", "Hybrid", etc, and a new blue outline appears on the streets where "Street View" is available. 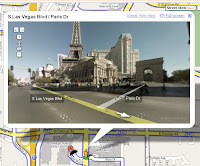 Click anywhere on an outlined street, and an icon is positioned at that spot on the map. A green arrow of sorts shows you the direction you're facing. For your viewing enjoyment, a widget pops up and shows a wide-angle image of the immediate area. Want to take in all the sights? Simply click and drag the image to rotate a full 360 degrees. Want to meander up and down the street? No problem. Just click the overlaid directional arrows. Look really close, and you may find someone you know. I'm pretty sure I found a coworker in this picture of Times Square... Hey! I thought he was out sick today?!? Of course, Google claims to take the potential privacy consideration very seriously. 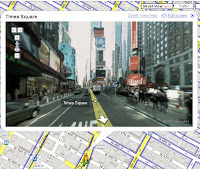 A link within the help screens for "Street View" encourages reporting images that are a "security" or "privacy" concern, along with those that may be inappropriate. This could be cool. Suppose these images will be extensible? Available via the Google API? How about interactive images where useful info would pop up when you hover over certain properties in the image? For example, maybe a phone number and a coupon would be revealed when you hover over the Paris hotel in Vegas? What ideas can we come up with? "It's all too easy to focus on the technical nature of EA outputs; which bits of the Zachman Framework should we complete? Should we mandate that all our models use UML?… and so on. Now don't get me wrong, it's important to get a handle on the scope of your efforts, and try and create some consistency in what gets done—but these things are means to an end, not the end in itself." "Where I see organisations spending a lot of time worrying about the format and scope of EA outputs and artefacts, often, perversely, it comes about because there's a lack of organisational ambition regarding the role and contribution of EA as a practice. The hole left by a lack of ambition here is often filled by huge technical ambition: 'let's model the world'. We all know what happens if you follow that road too far." "For EA practice to have a valuable contribution, it has to be prepared to prioritise conversations with business people (and less so with other IT people) over conversations with other architects. Although that's not within the comfort zone of every architect, it's critical. Real architecture has to involve real stakeholder engagement, otherwise architecture is just design with a corner office." "In the context of 21st Century business, the critical EA competency is the ability to drive shared language and multiparty understanding—and conversations." Neil describes a perfectly rational approach to architecture. One that takes into account the often under-represented breadth of the architect's responsibilities and the underestimated importance of engaging the business in active and pragmatic dialog. Sanjay Dalal at Creativity and Innovation Driving Business speaks with Erich Joachimsthaler, author of the new book Hidden in Plain Sight: How to Find and Execute Your Company's Next Big Growth Strategy from Harvard Business School Press. The book makes a case for the increasing importance of innovation in today's global economy and explains a number of barriers to innovation. It introduces the "Demand-first Innovation and Growth” (DIG) model that encourages an organized and deliberate approach to innovation. The DIG model is a systematic, systemic and repeatable process to identify and execute innovation and growth strategies. It replaces the existing model of SAV or screwing around vigorously, sometimes also called the fuzzy front end of existing innovation models. In the fuzzy front end, one searches wildly for ideas that then can be put through the classic stage-gate process of new product development. In the DIG model, the focus is not on the product, it is on finding ways of creating a transformational change in consumers’ everyday life. Innovation and growth is not about products or solutions – it is about creating a transformational change in the way people live, work and play – and in order to achieve that, the innovation can be a product, a solution, a technology and new business model like at Netflix or no product at all. It could even just be a management innovation like brand management at BMW or a better supply chain management process. Alastair Bathgate at WorkForceInABox wrote a compelling piece titled IT vs The Business - the Final Countdown? in which he asserts the following. a) the “can’t do” department, focussing only on operations and not strategy (I mean business strategy not IT strategy) and who buy blade servers and occasionally put out a tender for some outsourced development to compete against an SI proposal. b) the “can do” department that focuses on business strategy, acts as an interpreter between the business and the IT world, and perhaps most importantly focuses on solving business problems. Yes, of course the operations, governance, security and compliance still needs looking after - but that’s all overhead. The exciting bits are the bits that drive the business forwards and deliver value, not cost. And if you’re not at the centre of the business you are on the periphery - and that is no exciting, rewarding, or secure place to be…"
Let's be sure we're the "can do" department that focuses on business strategy. Indeed, Let's be the bilingual partner, actually participating in the definition of the business strategy, translating between business and IT perspectives, and establishing an IT strategy that supports the business. It's a challenging role, but I bet we're up to it. Ready? Set? Go! For as long as I can remember, I've been obsessed with the importance of contracts - deliberate definition/specification of component interface boundaries. In fact, I take a fair share of grief for climbing atop my soapbox on this topic. I suppose that's the price to pay for championing the cause. "Many architects define their elements, responsibilities, and interelement relationships well, yet totally neglect their interface definitions. Defining interelement interfaces clearly can often be something of a chore. However, it is on of the most important tasks you can perform for the system. Without good interface definitions, major misunderstandings will occur between subsystem development teams, leading to a range of problems from obviously incorrect behavior to subtle, occasional system unreliability." Bertand Meyer, the designer of the Eiffel programming language, was one of the early proponents of the importance of contracts. In “A Conversation with Bertrand Meyer, Part II - Design by Contract” (http://www.artima.com/intv/contracts.html), he puts it this way, "The main purpose of contracts is to help us build better software by organizing the communication between software elements through specifying, as precisely as possible, the mutual obligations and benefits that are involved in those communications." Taking it somewhat deeper, an effective contract specification provides an unambiguous description of the interface syntax and semantics - what it looks like and how it behaves. The contract defines the operations offered by the interface, the inputs, the outputs, the effects, and the nature or style of communication (web services, messaging, rpc, etc). Contracts should exhibit well-known design quality attributes such as separation of concerns, high-cohesion, loose-coupling, granularity and degree of element interactions and others. We’ll come back to those in detail another day. For today, let’s just emphasize one: the separation of concerns which engenders the ability to organize the development effort around the architecture. Effective contract definition allows individuals or teams to be assigned responsibility for delivery of specific subsystems or components, understanding how that functionality is integrated to the overall system. In other words, contracts help us to divide and conquer. It is squarely the responsibility of the Architect to lead the definition of contracts, and as mentioned above, it’s a common execution weakness. It’s essential that the Architect have ultimate responsibility and accountability for this aspect of the architecture. But the Architect is not a solo act and relies on the engagement of many team members or even multiple teams to achieve results. It’s important for the team members to understand not only “what”, but “why”. In other words, the rationale is also important. As such, successful execution of contract definition will typically require a command of the technical solution, awareness of good design attributes, and ability to orchestrate communication among interested parties - and facilitate negotiation when necessary. As an aside, you can see a couple of important characteristics of an effective Architect in this description. In particular, a successful Architect is a strong leader and a good communicator. It is not enough to make great decisions and define great contracts. The Architect is not successful unless the contracts are well-understood and agreed to by the relevant stakeholders. • Make sure that interface definitions include the operations, their semantics, and the examples where possible. Scott Ambler's Agile Modeling site has a good article on Anti-Patterns for Enterprise Modeling. Each of these Anti-Patterns is well worth taking a look, but I'd like to highlight a couple that seem to pop up quite often. 30,000 Feet and Climbing - The enterprise model is so high-level that it is of limited or no practical use to application teams. Solution: Develop reference architectures which provide working examples of individual aspects of your architecture. Roll up your sleeves and get actively involved with the development teams. Act on feedback from the development teams to evolve your model(s). Ivory Tower Architecture - Your enterprise architecture model(s) reflect a wishful, perfect world scenario instead of the realities of your actual environment. Solution: See the solution to 30,000 Feet and Climbing. Stuck in the Weeds - You are too far into the details, attempting to do all the work for application teams. Solution: Mentor developers in the architecture, work with them as equal partners on the development teams, and, after they've gotten going, focus on providing them with guidance and advice as needed. Brain Trust Parking Lot - Your enterprise modeling group is composed of a lot of very smart people who don't fit in well anywhere else within IT but you don't want to lose their knowledge. Solution: Find a way to make them useful to existing project teams, perhaps as a modeling mentor or as a subject matter expert (SME) in the business domain. Let's have a little fun this morning. No matter how many times I hear this, it still cracks me up. By the way, I stumbled into this today as I scanned through Booch's recent release of the 3rd Edition of "Object-Oriented Analysis and Design with Applications" and compared it to my dusty copy of the 14 year old 2nd Edition. More on that another day. This post could be subtitled, "The Architect Makes Decisions... and is ultimately responsible"
"The software Architect has overall responsibility for driving the major technical decisions, expressed as the software architecture. This typically includes identifying and documenting the architecturally significant aspects of the system, including requirements, design, implementation, and deployment "views" of the system." In this capacity, the Software Architect has ultimate accountability for the results of the project. When things go south, people should turn to the Architect to recover... and explain. All too often, we see cases where an Architect goes along with a project until the "architecture is done" and then moves on. When the project gets into trouble, you hear "Those developers didn't follow instructions" or worse. It's the responsibility of the Architect to avoid even this potential, something that can simply be accomplished by remaining a fully engaged member of the team - operating as "we" and "our's" instead of "them" and "their's". But the Architect's responsibility doesn't end there. The measure of success for the Architect is based on more than just the project results. He is also accountable for the Business and IT Strategy. It isn't enough to for the single project to successfully meet it's objectives, but the results must also contribute to these strategic considerations. Factors that are by definition more valuable and significant. Being successful in this capacity will almost always require an ability to balance competing stakeholder needs. The Architect rarely finds himself facing simple black-and-white decisions, but rather the need to carefully select just the right shade of gray, and to do so under intense pressure and without enough time and not enough information. That's the life of the Architect. Philippe Kruchten summed it up like this: "The life of a Software Architect is a long and rapid succession of suboptimal design decisions taken partly in the dark." But like most things in the endless balancing act of the Architect, we have to be careful not to fall into the deadly cycle of becoming the decision authority for every decision. While the Architect is accountable, he simply can't own every decision. Even if it made sense for some reason, it's simply not practical. The Architect is out-numbered by a factor of, perhaps, 10 or 20 to one on any given project, and those other 10 or 20 engineers aren't just drones - they're experienced professionals who's input is essential. This practice keeps the Architect focused on the most significant decisions - those of the greatest value (and consequence) and of the type that require the broadest perspective and authority. But we have to be careful. This is essentially a form of delegation. As is always the case with delegation, we can transfer the responsibility but not the accountability. The Architect remains accountable for the overall results, and he must put practices in place to effectively assess those results throughout every stage of the project. A few of us were discussing this concept of accountability recently, and someone tossed out the idea that the Architect is responsible from "cradle to grave." That's a good way to look at it. The Architect is accountable from the first stages of ideation all the way through to the production release and beyond as this new capability helps to realize the overall Business and IT Strategy. We got to thinking, though, and decided maybe "grave" wasn't a good thought to associate with this accountability. How about if we just say the Architect is accountable "From Cradle to Glory." What's All the Fuss About Architecture? Software Architecture is all the buzz in the IT world right now. What's up with that? I think of it like this. Over the past decade, the decentralization pendulum gradually swung full-tilt towards distribution. To a large degree, individual divisions or departments were chartered with building out independent systems, absent of any unifying IT strategy. In fact, in some cases, software was being put into production completely within a business unit with no IT involvement at all! New applications sprung up like dandelions, as businesses scrambled to respond to competitive pressures and leveraged the climate to wrestle "control" away from the IT "Borg." While for some time, this approach yielded favorable results in terms of flexibility and speed to market, it was a course of divergence that could only lead to one place - the place we find ourselves today. Disparate systems, duplication of resources, closets full of unknown capabilities, inability to leverage corporate assets, etc, etc. Meanwhile, the "science" of Software Architecture and enterprise technologies have continued to mature to the point where intelligent IT strategies promote more enterprise-scale thinking and yield tremendous competitive advantages. It'll be our job to ensure that the pendulum swings back into balance so we position IT to be the "go to" guys and gals for the business... a partnership of mutual objectives and ambitions... jointly pursuing the overall goals of the business. As an architect, one of our most important responsibilities is working with the business stakeholders to understand their objectives and help ensure an effective solution. What's more, we typically need to understand the problem domain (or learn it very quickly) so we can help define those requirements and develop the solution strategy. The role of advocacy is exhibited in many activities (negotiation, scope management, corporate politics, risk management, prioritization, etc. ), but let's quickly highlight just two that revolve around the principle of understanding the problem domain. The architect's awareness and appreciation of the business domain is essential to the best definition of a software-systems capabilities. The architect is able to understand likely requirements and encourage penetrating assessment of key product areas. I like to think about this in terms of how understanding the "solution space" has influence over the understanding of the "problem space". It's true we want to maintain separation of our models and abstractions between these domains, but it's critical that the solution side have a deliberate and calculated influence on the problem side. In my classes, I like to use the example of buying a new car. While this is a low-level example, I think it illustrates the topic well (and it's easy to personally relate to). With a few essential "market needs" in mind (e.g., 4 door because it'll be too hard to get the car seat in and out of the coupe when the new baby is born, 6 cylinder because this 4-banger isn't cutting it in Atlanta traffic, and candy-apple red because, well, just because), we head out into the "solution space" (wandering lots, reading brochures, taking test drives, talking to friends, reading Consumer Reports, etc) and begin to evaluate our options. The available options immediately begin to influence our understanding of the most suitable feature set - the best balance of needs and solutions - and we ultimately arrive at the best "product." The architect is most effective at helping to arrive at this "perfect balance" when he or she has a practical understanding of the business domain - the "problem space". The architecture of a system is subject to the tides of change within the business environment being served, reinforcing that the architect should be familiar with the business domain. In this regard, the architect needs to anticipate future changes to the architecture, and integrate styles that lead to the most valuable types of flexibility, a challenge more readily met with an appreciation of the business domain. For example, architects of today's payments-related systems should be keenly aware of the industry trends towards payments convergence - the collapsing of disparate payments channels into fewer products with greater compatibility and higher-value capabilities. Likewise, regulatory changes in the financial services space are shifting the landscape and encouraging the overlap of banking, insurance, and health care services. Business factors such as these industry and government trends must be taken into account in the design of effective architectures. "The architect and client meet when it is all over and reminisce about the trials and triumphs. They hold a big party at a Mexican restaurant, complete with Mariachi Band, for all the builders, employees, and customers involved with the project. Those nay-sayers who whined incessantly and said it couldn't be done now stand mute, sipping their margaritas. (http://www.wwisa.org/wwisamain/role.htm)"
When I was a kid and would start to make something into a big deal, I remember my mom accusing me of making a "mountain out of a mole hill." That may be an expression that only makes sense here in the southern part of the US, but it seems to be applicable to projects I see all over the world. The systems we undertake today, and the technologies we have at our disposal, certainly allow us to make mountains. Of course, we all know mountains tend to be rigid and inflexible - immovable. In response, a deliberate practice - a core value - of delivering simplicity has become even more important in today's IT climate. What I'm thinking about here spans both the problem space and the solution space... we must simplify the problems and simplify the solutions. But what does that mean? I bet we all can think of plenty of examples where we allowed the business problem to get out of hand. Allowed it to grow nearly unbounded. I've witnessed a couple of projects over my career where "we" fell into the "boil the ocean" trap in the problem space, imagining that a product could not go to market unless it had nearly every conceivable feature. We allow the project to get bogged down in "requirements gathering" and don't demonstrate the collective discipline (and confidence) necessary to establish direction and make hard decisions on trade-offs in the market. I'm thinking about things like which features are really required and which are not. It's true that there are market situations where a product should not be released without all the "bells and whistles" or "this and that", but those scenarios are rare. Generally speaking, we do our business partners a tremendous favor by encouraging an environment that releases "right-sized" product and builds on it over subsequent releases. This reminds me of a story... About 14 years ago, when I first left the US Air Force, I was working with a team building an internal account payables system. Users of the system choose the appropriate cost center upon login, and about 10% of the users had rights to access more than one cost center. When the user was ready to operate on a different cost center, they would have to logout and then log back in, this time selecting the alternate cost center. I made a case that we should change the screen design to allow the user to choose a different cost center without logging out. This alternative design would simply place a drop down list or something to that effect in the product. The user would select the appropriate cost center from the list. My boss at that time argued against this approach and helped reinforce the importance of managing scope on the project - and on the product. It's not just the 15 minutes that it would take to add the feature (and that's really all it would have taken), but it was also the longer term consideration such as "care and feeding" of this capability, the constraints it introduced on the future evolution of the architecture and design, etc. It was a 15 minute change request in this one project, but it had hours and hours of impact over the life of the product. My boss insisted, "one of my principle responsibilities is to control this scope." I learned a lot from this guy. I think we all can. Today, many of us can think of projects where we refused to let the "15 minute feature" get in, but also the dozens of other features, functions, etc, that ultimately lead to the death of a product or project - crushed under it's own weight. Where successfully managed, these products remain lean and responsive to change, able to keep up with evolving demands over a healthy and long life. We can see similar characteristics on the solution side. Most developers I know really care about the "right-ness" of the design and implementation of the product. Their heart is in it, and they want it to be "perfect." And high-quality, precise work is always right and proper. We should never settle for mediocrity. The trouble we seem to run into, however, is in the definition of "right" or of "mediocrity." How do we assess the "right" design and the "best" implementation? The tendency seems to slant towards more or bigger or complex, when we should evaluate a solution based on the degree to which it satisfies the requirement and on its simplicity - the elegance of its simplicity. Without direct energy applied, a team frequently migrates towards what I like to refer to as "someday maybe" design. The design begins to get tweaked in sometimes subtle ways to account for the idea that "someday maybe" we'll need to be able to do X, Y, or Z. The "right" design satisfies today's requirements without trying to predict the future, recognizing that the chances of predicting correctly have been shown to be very slim, AND, when the future comes and we know what it holds, we can change the design. At that point, we'll be in the advantageous position of knowing precisely what's needed (based on actual data and experience as opposed to predictions), and we'll be able to get the design "right". I'll assert then, that the best design is the one that satisfies today's requirements while leaving options open for tomorrow's. Just one brief example while we're on the topic of simplicity in the solution space. I recently witnessed a project where there was a fairly straightforward b2b web service interface that precisely satisfied the market needs. Falling directly into the "someday maybe" trap, the team added additional attributes to this interface - attributes that were not used in any fashion today - just in case they may be valuable to the business in the future. Compounding the situation, the team built a separate database to store the service response and create reports to demonstrate whether or not the b2b partners were populating the unused fields. The cost to the business is significant as a result of design by prediction rather than data, architectural inflexibility, additional scenarios and code paths to test and design around in future releases, client implementations and documentation confusion, etc. On my teams, we incessantly strive to find the most straight-forward solutions to problems and execute those solutions with pinpoint accuracy. You’ll hear team members and managers echo the phrase “do the simplest thing that could possibly work” and challenging one another with "is that really the simplest thing?" This is a key principle of an agile, nimble, and responsive development team. And interestingly, this principle manifests itself in the products produced by such team. The products themselves exhibit agile, nimble, and adaptable characteristics, essentially mirroring the nature of the team that created them. "Treat every problem as if it can be solved with ridiculous simplicity. The time you save on the 98% of problems for which this is true will give you ridiculous resources to apply to the other 2%." I've consistently found this to be overwhelmingly true. Without the precise data to back it up, I'll assert that a focus on simplicity reduces the overall work effort on a project by up to 50% and enables the Business/IT partnership to more quickly deliver higher quality software that satisfies the market needs. These same products then respond to the pressure of market change and evolution in a much more resilient manner, ultimately leading to higher profitability and better performance in the marketplace.